Last night I stamped and printed a few images, grab my bucket of copics, perched myself in front of the telly with a coffee and big block of chocolate (cadbury of course) and set about some colouring. So with my coloured images looking all so pretty today I went on a search to find a sketch to use them. And here is my little Matilda looking her finest and of course some yummy papers from My Minds Eye just makes her look even finer. Its show holiday here in Toowoomba, so the Children and I are off to have lunch with Nanny for her Birthday, so I better go scrub up. This is so darn CUTE, Tammy! 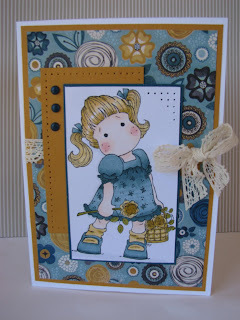 LOVE the colours you used, the paper looks fabulous, and the lace trim is a gorgeous touch. Auhhhh, she is so cute. I love your DP and color combo. Thanks so much for sharing your adorable card with us. Tammy this is fabulous. Your coloring is just so amazing on that darling Matilda image. Beautiful colors and papers. Thanks so much for playing along with us at Sweet Sketch Wednesday! Tammy I love the colors you used. Your paper is adorably sweet. Have a sweet day!!! Arlana@SSW!!! Well Tammy there's no coffee or chocolate marks on your card, it looks awesome. This is such a sweet image of Tilda and what wonderful colours just awesome and your design paper are perfect. Thanks so much for playing along with us at Sweet Sketch Wednesday and good luck. You're a girl after my own heart, coffee and chocolate in front of the tv coloring images!!!! And what a sweetie you've created here. Love Tilda and your wonderful papers. Thanks for joining us at Sweet Sketch Wednesday. What an adorable card, beautiful papers and fantastic coloring. So glad you could join us at Sweet Sketch Wednesdays. She is just adorable and I like all of your added details! Thanks so much for joining us this week at Sweet Sketch Wednesday. Hope you had a wonderful holiday! 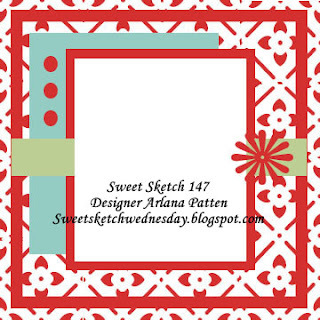 Love your color palette on this and your coloring is stunning....So glad you could share with us at Sweet Sketch Wednesday.